You may receive a warning telling you that security issues were encountered. If you are certain that you are securely connected to your server (i.e. the name and thumbprint displayed by the client matches the server thumbprint), you can continue. However, if you are not sure about having established a secure connection, do not continue or you may risk exposing your secret data; check with your administrator for assistance. 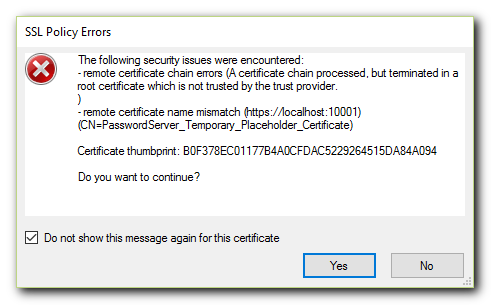 If you do not wish to see this message again until the thumbprint changes, click "Do not show this message again for this certificate". By default, in an secured intranet environment, you should generally be safe even if using the default certificate. For security reasons, we recommend using Password Server with an FQDN and a third-party signed certificate. Check that your certificate thumbprint matches your server thumbprint and choose accordingly whether to continue or not. If you are being attacked and you continue, all your secret data will be at risk of exposure.